The microphone search engine just got a little smarter. If you have strong feelings about the use of transformers in output circuits, now you can limit your search results accordingly. 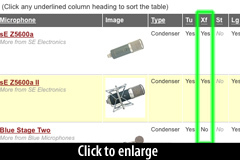 If this seems esoteric, consider that there are basically four types of condenser microphone circuits: tube or FET amplifiers, with transformer-coupled or transformerless outputs. We just got a step closer to making all of this clear in the database. 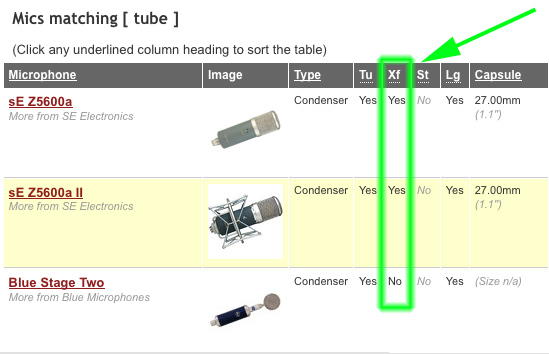 The search results page got a new column to indicate the presence of a transformer in the mic’s output circuit. The heading is “Xf;” mouse over it for a tooltip. We’re on the verge of reworking the specifications block on the mic profile pages soon, too. We have some noise figures (long overdue) and better condenser-capsule data. Stay tuned!